In the mid-1800s, many immigrants were flooding into London, mainly into London's East End. Irish immigrants were coming from the West, and Jewish Immigrants were coming from the East. The sudden jump in population led to worsening of conditions in London. On April 3rd, 1888, the first of eleven "Whitechapel Murders" took place in London's East End. 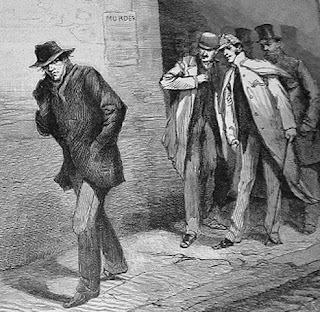 During the investigation process of these eleven murders, at least five are assumed to have been committed by the same person, who became known as Jack the Ripper. On August 31st, 1888, the body of Mary Ann Nichols was found, with her throat cut and her abdomen ripped open. From that date to November 9th, 1888, there were four more murders, each similar to the one described above. Each murder victim was a poor women, and each body was mutilated, some even having organs missing. As the police investigated the Whitechapel murders, it was assumed that the Ripper was a man who lived in London and worked during the week. This was assumed because the Ripper struck around a certain area of town each time, yet only struck during the weekend. The police first investigated surgeons, butchers, other workers who handled knives, believing that people of these occupations were more likely to kill victims by cutting them with knives. Unfortunately, all the main suspects had alibis that checked out. There were hundreds of letters sent to the police and the newspapers whose authors claimed to be Jack the Ripper. In the letter known as the "Dear Boss" letter, the author became the first to use the name Jack the Ripper, which became a world famous name. In another letter, known as the "From Hell" letter, the author sent half a kidney, which the author claimed was the kidney of Catherine Eddowes, who had had her kidney stolen during her murder by the Ripper. The author also claimed that he had cooked and eaten the other half of the kidney. Though most letters were immediately thrown out as hoaxes, the "From Hell" letter was kept, though it was never discovered whether the kidney was indeed Eddowes's. As the murder investigation progressed, the media caught onto the story. Tax reforms had made printing newspapers much cheaper than before, and Jack the Ripper's story was one of the first to be widely distributed throughout the city and the country. The true identity of Jack the Ripper was never discovered, though policemen investigated the murders until 1931. Jack the Ripper became a legend, a fairy tale to scare children into being good. The Ripper's appearance also helped to bring media attention to the poor living conditions of London's East End. Jack the Ripper is on our list for being one of the few people who remain famous (or infamous) without actually having a face to put with their name.